Make it a classic or make it your own- with this book, you can create virtually any cheesecake you can imagine. 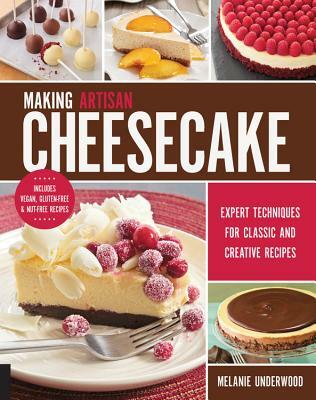 Making Artisan Cheesecake presents the classic and well-loved cheesecake in a new, adventurous, and modern way, and answers any questions about it that home cooks and bakers- foodies who love delicious classic desserts- might ask. In addition to sharing many variations, author Melanie Underwood teaches all the techniques behind building a range of different styles, and encourages readers to develop their own unique recipes. She also covers options for crusts, cheeses, and batters; baking techniques; how to keep the top from cracking; and the differences among various styles, including New York, Philadelphia, Chicago, Italian, Brazilian, and Japanese.